"There's nothing here. 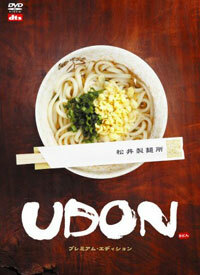 Just udon." The story starts in a town in Kagawa Prefecture, home to 1 million residents and 900 udon restaurants. Kosuke Matsui - an aspiring comedian and son of an udon noodlemaker - hates his small-town life, but hates udon even more. After a fight with his father, he goes to New York to launch his dream career as a stand-up comedian, but six years and one massive debt later he is forced to go home. When he returns, he finds nothing has changed -- his sister still worries about him, his father is still pounding away at noodles, his friends are the same, and there's still a bowl of warm udon waiting for him when he gets home. To repay his debt, he works at a publishing company where he meets Kyoko. Together they write a column about udon, which surprisingly kicks off an udon sensation across Japan, changing their lives. Especially Kosuke's.